Product prices and availability are accurate as of 2019-03-24 12:45:10 EDT and are subject to change. Any price and availability information displayed on http://www.amazon.com/ at the time of purchase will apply to the purchase of this product. Product Features: Back-to-back installation is ideal for unique or high-volume jobs Large internal ports allow quick bath filling Covered under Kohler's limited lifetime warranty Flow Rate 5 GPM at 45 PSI Scald guard protection Valve built out of brass High-temperature safety stops ensures water temperature stays below 120 degrees Fahrenheit Rite-Temp pressure-balancing technology maintains water temperature within +/- 3 degrees Fahrenheit. Universal NPT and direct sweat connections need no additional parts for installation. Product Specifications: Max Flow Rate: 5 gallons-per-minute (GPM) Connection Size: 1/2" NPT About Kohler: This Rite-Temp pressure-balancing valve works behind the scenes to prevent scalding and freezing for a safe, comfortable water supply. 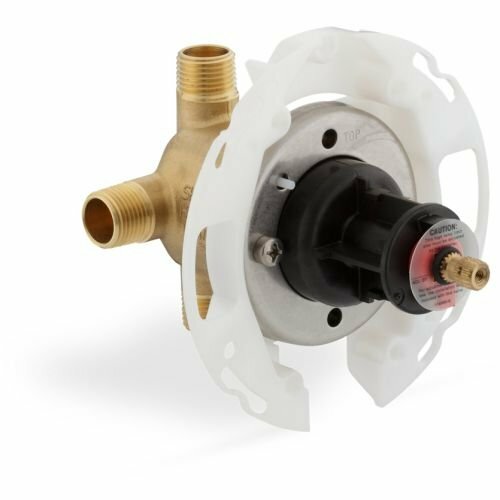 The valve features a high-temperature limit stop and an optimal comfort zone, so you can set a maximum high and then find and maintain your desired water temperature. Additionally, the unit has a diaphragm design that virtually eliminates freeze-ups from contamination and water debris. Universal NPT and direct sweat connections need no additional parts for installation, and screwdriver stops allow you to turn off the water supply at the valve.